Newspaper headlines describe Woeser as Tibet’s most famous woman writer and blogger and a lone Tibetan voice, intent on speaking out. Until now, Woeser has perhaps been best known as a Tibetan dissident writer whose blogs are banned and have either been repeatedly shut down in China or hacked by Chinese nationalists. Her collection of poems, short stories and essays published in 2003 by a renowned publishing house in southern China entitled “Notes on Tibet” was subsequently banned and, refusing to be subjected to political re-education, she left her prestigious job as editor of a literary journal in Lhasa, as well as all the security such a job brought, and went to live in Beijing, where she still continues to live today. In March 2008 she was briefly placed under house arrest, during which time she became the main source of information regarding the wave of protests and demonstrations that swept Tibet, as chronicled in the daily Tibet Updates on her blog. The threats to her personal safety have been well documented and translations into English of her Tibet Updates, published online on China Digital Times, have brought Woeser and her work to a wider audience. In July 2008, her decision to sue the Chinese government for their continued refusal to grant her a passport was a brave, audacious move, testing China’s legal system and bringing the plight of Tibetans as second-class citizens within China to the world’s attention. Now a new volume of translations of Woeser’s poetry is available to English readers thanks to the efforts of scholar and translator A.E. Clark. 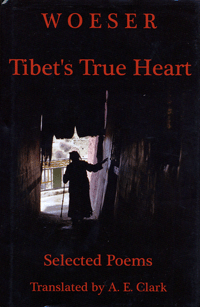 “Tibet’s True Heart”, published by Ragged Banner Press, brings together original translations of 42 poems written by Woeser spanning a period of 20 years. It is a remarkable volume of poetry with translations that not only do justice to an eloquent, moving literary voice but also enlighten and educate with the copious notes, explanations and maps included in appendix. The earliest poems contained in this volume were written in the late ’80s during Woeser’s days as a student of Chinese literature in Chengdu’s South West University for Nationalities. Although born in Lhasa during the Cultural Revolution and spending her first four years there, her family moved to Kham and she spent most of her childhood in Tibetan areas of Sichuan province, Chengdu being the provincial capital. Woeser candidly writes about growing up Sinicised – her father was a high-ranking officer in the People’s Liberation Army and she grew up very much in a Chinese-speaking environment. In her 2004 poem “Tibet’s Secret” she writes “From birth I grew up to the bugle calls of the PLA / A worthy heir of Communism”. As Clark writes in his notes, “Derge was the birthplace of her father and was associated, in her mind, with his death”. “She lacks the root of wisdom. As mentioned previously, it was in 2004, again in Beijing, that Woeser wrote the poem “Tibet’s Secret” dedicated to Tibet’s political prisoners, some of whom she knew personally. She poses the question: “of the people in prison, why are so many more wearing the red robe than not? […] we’re glad to leave the suffering to our monks and nuns […] With shame I count down their practically endless prison terms. / Tibet’s true hearts beat steadfast in a Hell that’s all too real.” Realising that due to her background she could easily have never heard about their fate, (“what’s the connection between them and me?”) she reflects on what they represent and compares her upbringing with theirs ending with their shared fates of exile and isolation, “Far from home, enmeshed in a race forever alien, […] Considering it carefully, how can there not be a connection between them and me?”. The lines connecting the disparate true hearts of Tibet are as much virtual as psychological or emotional – technology has played a crucial role and undoubtedly created new space for reflection and self-education. Woeser’s knowledge of a political prisoner’s plight comes from “a biography I downloaded in Lhasa” and “It was only on the Web I saw, spread out before an old man, An array of handcuffs, leg-irons, daggers…”. In “Remembering A Battered Buddha” her memory of that Buddha is kept alive digitally, “I only took some pictures, So when I miss it I can turn on my computer and have a look.” The contemporary feel is refreshing and at times provides relief from the overwhelmingly melancholy tone of the poetry. In “Spinning Wheels”, the wheel metaphor is not only the classically Buddhist circle, or Kora, or Mani wheel but also “Mitsubishi tracker wheels, Beijing jeep wheels, Dongfang truck wheels, long-distance bus wheels, Minivan wheels, red taxi wheels, Walking tractor wheels.” These observations also give the reader an accurate impression of life in Tibet today where wheels symbolise the development and changes taking place as much as the religion. Woeser’s details also identify the greatest changes taking place in Tibet today, the poem “Return to Lhasa” mentions “little fake zebras […] a pink fake lotus […] I saw the celebrated Qinghai-Tibet railway on a concrete overpass”, even noting that the taxi drivers speak in Sichuanese dialect portrays Lhasa today exactly. Leaving aside the Tibetan themes and subject matter, there are universal themes of love, loss, grief and struggling for identity and meaning in the poems. A highly literate poet, Woeser’s points of reference are very accessible for English-speaking audiences as she keenly cites Allen Ginsberg, T.S Eliot, Gabriel García Márquez and at least one poem owes a great debt to Jack Kerouac. It is also rare that a translator can disappear to leave the poet’s own voice resounding and A.E. Clark’s translations, sensitive and true to the originals, must be commended for their elegance. Woeser is a prolific writer, blogger and poet who has given up a great deal in pursuit of the truth in her own time and on her own terms. Overcoming both prescriptive and prohibitive censorship to ironically become a truly free thinker, Woeser is a unique and much needed Tibetan voice. In the burning house of the People’s Republic of China, Woeser has so far managed to find and make use of every fire exit and trap door in order to be heard. “Tibet’s True Heart” goes some way in ensuring that these remain open for a while longer.